The last few days have found one or both of us down with the flu. 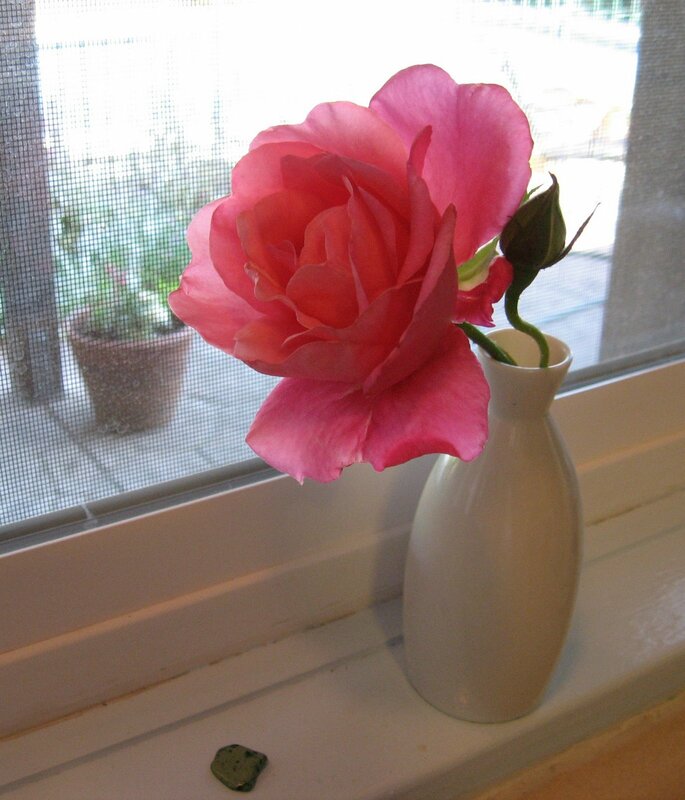 I resisted until yesterday, after I returned from an early-morning gardening session at church, where I had accidentally broken off a rosebud. This morning it greeted me thus. I’m very thankful for it, a little present to cheer me up as I am missing a wedding and the chance to visit with friends and family from out of town. Last evening was my worst sickly period, and the thought of cooking dinner made me cry. So I sat on the patio and read The Folding Cliffs. What strange interaction followed, and gave me creative energy to go into the kitchen and make dinner, I can’t really understand, and I won’t try to go into it here–but I managed to make another meal with what was on hand, and this time it was burritos with scrambled egg filling, spiced with chili and cumin, onions and garlic and sweet red pepper and cilantro. Cheese, too. And love and thankfulness and peace. That was the miracle that came from On High, via a fellow human using the written word with care. And some fresh roundish fruits we called tomatoes, one each left in produce bags from two shopping expeditions. I had bought one, B. the other. One from Mexico–not surprising–and the other from….Canada! What? The information on the sticker was so alarming to me, my mind ran away and I forgot to take a picture for proof that the world had turned upside-down, not least geographically. I didn’t add chile-type “heat” to the filling I made, so we added it at the table in the form of sauce from a bottle. And this is the perfect time to display photos I took some time ago and have been waiting for a chance to use. 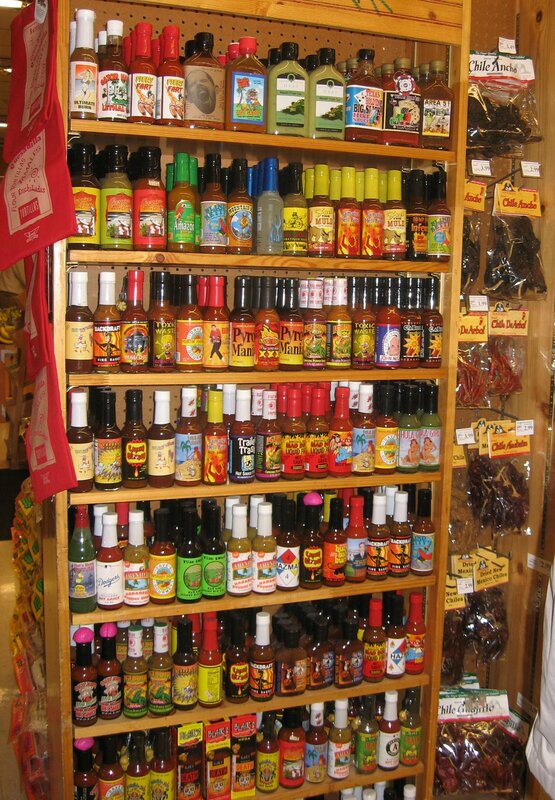 Whether or not something requiring spicing-up is going to be on the table that night, when B. and I are in a particular local market, we like to peruse these shelves full of a library of hot sauces, right next to bags of hot chiles, in case you want to make your own, perhaps. 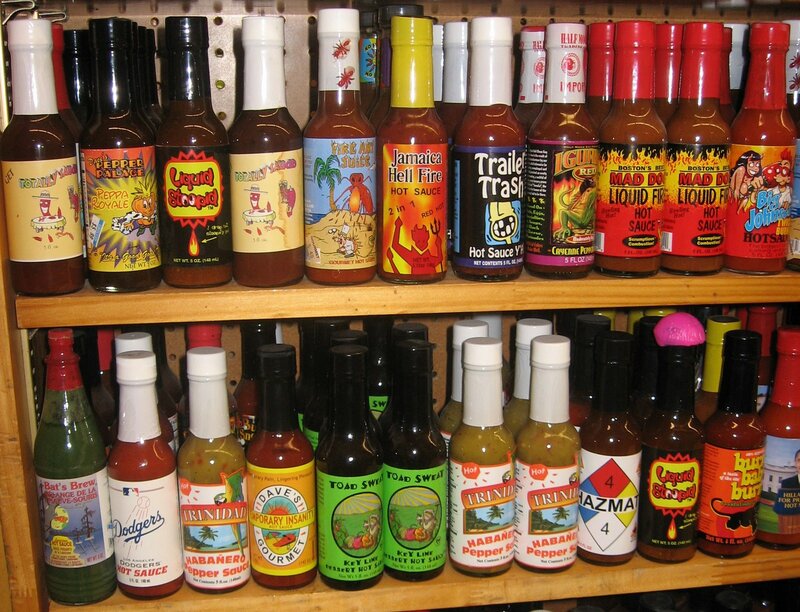 But we rarely have any of these playfully fiery brews around to use on our own Tex-Mex food, as we long ago developed a taste for Crystal Louisiana Hot Sauce, when as head cook I didn’t always distinguish one culinary region from another. And Crystal is cheap. At the end of our meal, there were a few chunks of the reddish fruit left in their blue bowl. B. asked what to do with them, and I said, “Throw them out. I don’t ever want to buy a tomato out of season again.” You see, I had also been reading about M.F.K. Fisher and realizing that these sorry, pale things with nary a drop of flavor or juice do not express me. Ha ha. I’d like to return my kitchen to the days memorialized in this photo, when we had our fill of dead ripe tomatoes in the summer and fall, and the rest of the year made do with canned or dried or frozen. 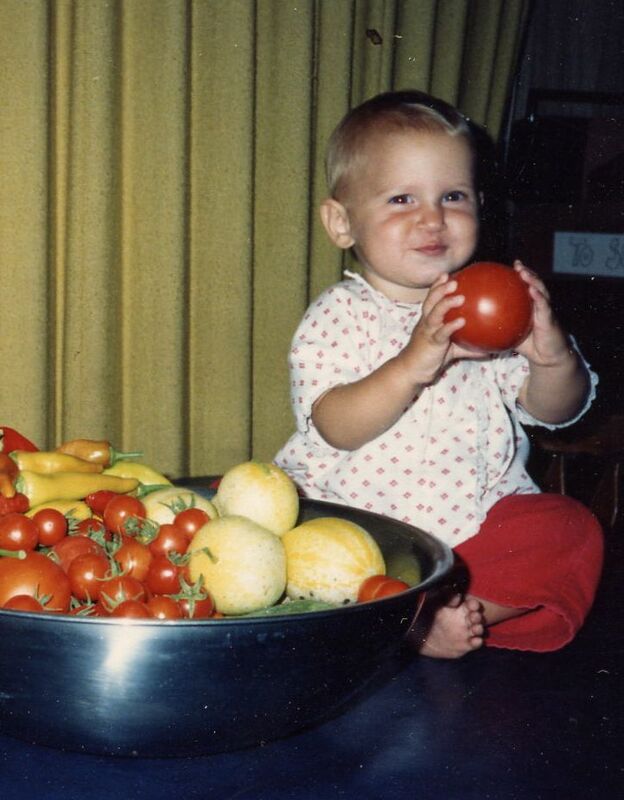 In the coming months I’ll write more about tomatoes– growing, picking, buying, cooking. As to eating them fresh, I think it’s best, for now, merely to anticipate. Fragrance,color,textures…I still remember perfect tomatos my brother Lloyd grew in our backyard. We took the salt shaker into the garden one afternoon to feast right there.